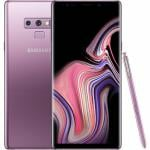 The Galaxy Note 9 is Samsung's ground-breaking phone that takes super strides in several key areas, including performance, power, storage and battery life. For the first time, the S Pen uses Bluetooth technology, which becomes a remote for the Galaxy Note 9. Take photos, change slides, and even pause your YouTube video with the press of the button, or you can customise the controls. The S Pen is recharged by sliding it back into the Galaxy Note 9; you'll get another 30 minutes of power in 40 seconds. Another talking point is the dual aperture camera, which adapts to bright light or low light automatically, with suitably breathtaking results at any time of the day. The iris scanner and sensors are hidden away for a clean and sleek first impression. The Infinity Display is as impressive as ever, thanks to the wide Quad HD+ Super AMOLED screen. The Galaxy Note 9 is winning rave reviews from gamers. The processor greatly minimises lag, overheating is kept under control by a water-cooling system, and an AI-based performance adjuster keeps the action smooth and flowing. The Galaxy Note 9 takes storage to incredible levels. Potentially, you can start with up to 512GB of built-in storage and add 512GB more if you wish. As we now use our phones more like mini PCs, this storage capacity is more than welcome. With so much happening on the Galaxy Note 9, you'll be pleased to know the 4000mAh battery can go all day on a single charge, allowing you to make the most of every feature when you need it.